We perform experimental and theoretical studies of the series-parallel arrays of the cold-electron bolometers integrated into a cross-slot antenna and composed with an immersion silicon lens. 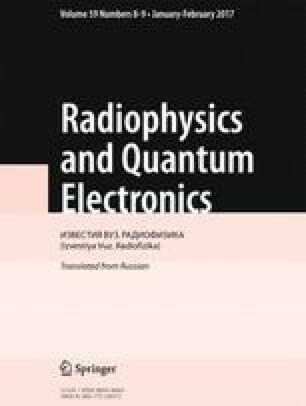 This work is aimed at determining the efficiency of radiation absorption by bolometers, their volt-watt sensitivity, and equivalent noise power. The absorbed power was found using two independent methods, which ensured a better reliability of the results. The first method is based on comparing the experimental current-voltage characteristics of bolometers with the model based on the heat-balance equation. The second approach involves simulation of the electromagnetic properties of the system including the antenna, the lens, the bandpass filters, and the radiation source. The discrepancy among the results obtained using various methods does not exceed 30%. Optimization of the experimental setup is proposed to reach the photon-noise detection regime. Translated from Izvestiya Vysshikh Uchebnykh Zavedenii, Radiofizika, Vol. 59, No. 8–9, pp. 842–851, August–September 2016.